I felt silly the first time I tried this. I had to talk myself into it over and over again. I mean …REALLY. You set a plastic mechanical timer (preferably one that is shaped like a tomato because it’s traditional) for 25 minutes, and then you go do a thing you’ve been putting off (like writing a blog or a poem, for instance). When the bell rings, you stop and rest for at least five minutes. Repeat, repeat, repeat. (It’s also traditional to do the sequence four times.) Finding the old tomato timer at the Kula Iki thrift shop was a sign that I HAD to do this, I told myself. The plastic tomato (or whatever other silly mechanical timer you can find) is supposed to help you develop a new habit. You have to set a particular task or project before winding up the tomato and then you do that task while the silly thing sits there going tic-tic-tic. A funny thing happened, though. This bit of silliness actually worked! Done stuff kept piling up as I went through the ritual every day for weeks on end. That silly tomato and me got to be great friends! This bit of silliness, which is called the “Pomodoro Technique,” is an actual time-management exercise. It was developed by a very successful entrepreneur named Francesco Cirillo when he was a university student in the late 1980’s. (An authentic Cirillo-authored book about it costs some bucks these days. It’s become a collectible.) Cirillo named the technique after his plastic tomato timer. The technique is supposed to help you develop your focus. Other folks have taken up the banner and run with it. 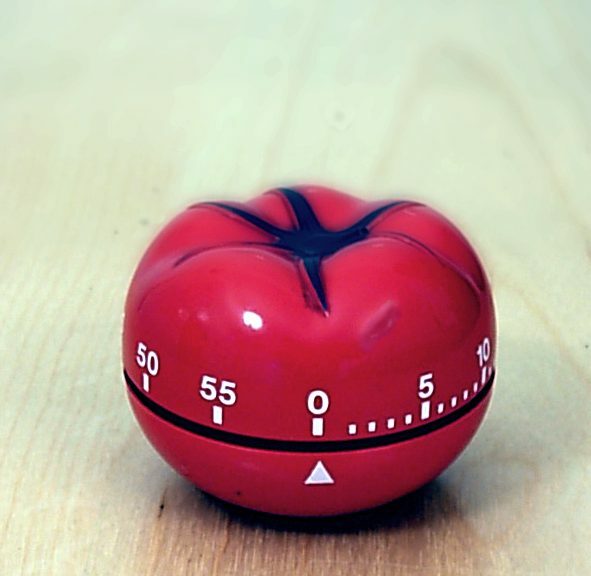 HERE’S HOW YOU DO THE POMODORO…. All you really need is a timer that ticks and dings after you reach the end of a time period and a small piece of paper and pen. Decide on the task you want to do. When the timer rings, put a checkmark on the piece of paper. If you have fewer than four checkmarks, take a short break (3 to 5 minutes), then go back to Step 1. If you have more than four checkmarks, take a longer break (15 to 30 minutes), then reset the checkmark count to 0 and go back to Step 1. Four checkmarks = one Pomodoro “set.” Each Pomodoro is “indivisible.” If you’re using it the regular way for developing focus, every time you get interrupted you ignore, postpone or record whatever it is and get back to it after you finish your Pomodoro. If you can’t ignore or postpone the thing (or if the person who’s interrupting you is a persistent little person who keeps playing with the tomato), then you have to abandon that Pomodoro set. When you get back to it, it’s like you are starting a whole new set-of-four. Design Gifts has tomatoes, lemons, apples, peppers and a bunch of other silly ticking timers. They are fun, they’re under $10 and they work. You can get one at Amazon.com. Since I tend to get OCD about things and really hyper-focused for hours on end, I also used this technique to STOP me from getting lost in a project that was particularly entrancing. The tomato helps to make me stop every twenty-five minutes and take a break, then stop completely when I’ve done my four. This, too, is a very good thing. The point of all this is that this technique is a beauty. If you are easily distracted or very good at talking yourself out of doing a thing you want to do , the Pomodoro will help you start to work on your Someday Project and actually help you form a habit of working on it until you’re done. If you’ve got the other problem and tend to get lost in some project or other to the detriment of the rest of your life, it helps you stretch your attention back to the normal world. How cool is that? Sometimes I think boring would be just FINE…. Mouth all set to pout and whine. Without a thought in an empty skull? It’s gotta be better than all this rattle-and-roll. Catching the 2x4s, prat-falling down and down. Why isn’t boring part of my fate? Why is it always ridges for running, thin ice to skate? Ah, well…here I go, back to the grind. Boring’s another country of the mind. Gotta get back to chasing those dreams.